"unintended consequences that are clearly not in our national interest"
Note: Some of the information here is speculative or even humorous. 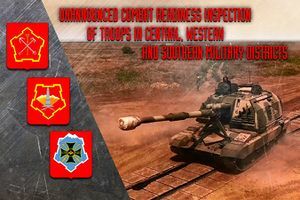 Operation Atlantic Resolve are ongoing efforts in response to Russia's actions in Ukraine, mainly the War in Donbass. All U.S. efforts in support of NATO fall under the umbrella of Operation Atlantic Resolve. 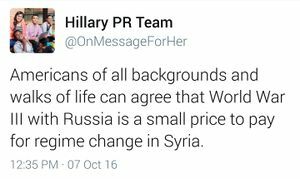 Refers to the aftermath of the Ghouta CW attack. The number of well-informed commentators, politicians, blogger and observers who are predicting a war - or at least of a serious risk of war - between Russia and the USA is sharply rising. Though I myself am rather inclined to believe that the US will use the Ukrainian junta to attack Russia rather then risk a direct confrontation, I would not go as far as saying that I find a direct US-Russian war impossible. If only because many wars are not deliberately started, but rather stumbled into. 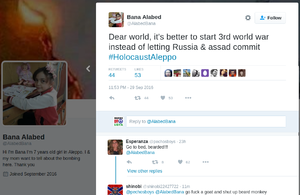 7-year old Bana Alabed from Aleppo ask for the "World" to start World War 3 on Syria and Russia. 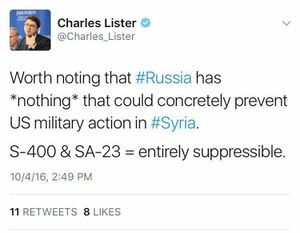 Charles Lister promoting US attack on Syria. 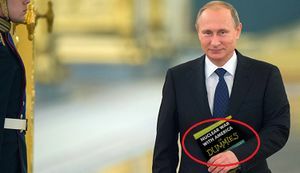 Please Russia, do not nuke us! Saber Strike exercise - US Army Europe. Saber Strike is a long-standing U.S. Army Europe-led cooperative training exercise designed to improve joint interoperability through a range of missions that prepare the 13 participating nations to support multinational contingency operations. The exercise - taking place from May 27-June 22 in multiple locations throughout Estonia, Latvia and Lithuania - serves as an effective proving ground for units to validate their ability to assemble rapid-reaction forces and deploy them on short notice where needed. (...) Leading up to the exercise, the 2nd Cavalry Regiment will demonstrate U.S. land forces' dynamic presence throughout the region, exhibiting freedom of movement during a 2,200-kilometer tactical road march, called Dragoon Ride II, from Germany to Estonia. Participating nations this year include Estonia, Latvia, and Lithuania, as well as Denmark, Finland, France, Germany, Luxembourg, Norway, Poland, Slovenia, the United Kingdom and the United States. US Military tanks and soldiers arrive in Poland for Military training exercise ... final day of exercises for Saber Strike 16 at Tapa Training Area, Estonia, June 20, 2016. Stop Assad Now—Or Expect Years of War - John McCain, WSJ, October 4, 2016. In a warning to Russia, the Pentagon said Tuesday that the U.S. maintains the right to self-defense against advanced anti-aircraft systems sent to Syria by Moscow. 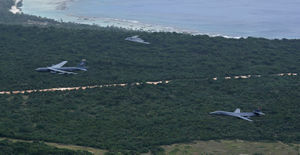 "Those aircrews have the inherent right to self-defense," Cook said at a Pentagon news conference. 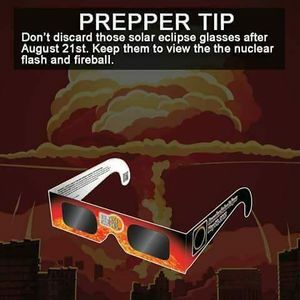 Stateside Military told to Prepare for Intercontinental one-for-one Nuke exchange! U.S. Army Chief Threatens War With Russia, The Comedy Central Alex Jones Channel, October 5, 2016, taken from: Dwight David Eisenhower Luncheon, Speaker: Gen. Mark A. Milley, Chief of Staff United States Army (full video). John Kerry Sends Regrets - WSJ, October 5, 2016 (Editorial piece goes after Kerry ). On Syria, @PressSec reiterates that military action against regime more likely to lead to "unintended consequences" not in US interests. "It's a fallacy to think that this is like the Cold War," Steinmeier said. "The current times are different and more dangerous." 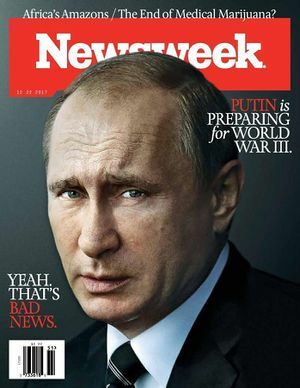 For the future historians, WWIII commenced with the US decision to terminate bilateral talks with Russia over Syria. Discussions of war between the USA and Russia began after American generals spoke at a Pentagon meeting on October 4, saying that war would be “quick and lethal”. Army Chief of Staff General Mark Milley said that armed conflict between Washington and Moscow was “almost guaranteed”. Moreover, Major General William Hicks said war would begin “in the very near future”, and the Pentagon has begun to prepare for combat on a scale that the US has not seen since the Korean War. Mr Johnson said a new set of "kinetic" options would be considered at a UK meeting of foreign ministers on Sunday (October 16). 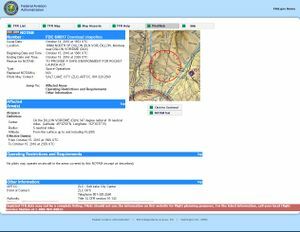 DEFCON Warning System – Update 10/13/16 - DEFCON 3. Discussed here, here and here. The end result of the official silence in the USA about Russia’s readiness to defend what it considers its national interest is that Americans are flying blind. Russia test-fired P-700 Granit anti-naval supersonic cruise missile from a submarine, on a shore-based target. We can’t completely rule out this happened by accident but considered that the risk of breaking OPSEC with an inaccurate use of ADS-B transponders is very well known it seems quite reasonable, in a period of raising tensions with Russia, to believe that the unmanned aircraft purposely broadcast its position for everyone to see, to let everyone know it was there. 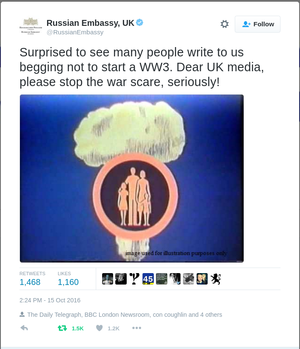 The real traitors to British interests are genuinely dangerously close to pushing us into WW3 with their ironically Stalinist approach to the topic of Russia, and anyone who is willing to acknowledge the existence of the world’s largest nation, or sin of sins: question the desire to declare all-out war on it. From Farage to Trump, anyone who queries why we are hell bent on going to war with Russia and Syria is immediately branded as a traitor and personal puppet of Putin. The Ohio-class guided missile submarine USS Georgia (SSGN-729) surfaces near Souda Bay, Crete, allegedly for 'refueling'. Alleged Russian cyber attacks to influence the US elections. Russia’s military exercises in its own country. Russia sending hundreds of paratroopers to long time ally Serbia. 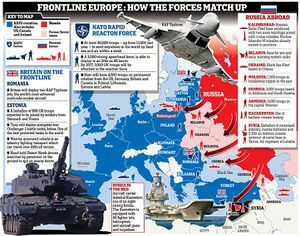 “Russia using propaganda in Europe among NATO allies”. The photographs in this post were taken from Tikaboo Valley, near Groom Lake, Nevada, by Phil Drake, who was lucky enough to observe a Su-27P Flanker-B dogfighting with an F-16, presumably one of the four Groom Lake based -D models in the skies of the famous Area 51... The date was November 8th, US election day, and the sighting was between 1500 and 1525. If [Trump] remains firm and pulls us out of the spiral of US-Russia confrontation, he will be stepping back from the conflict that has seemed more likely than any other to explode into nuclear war. Prediction: Donald Trump will have to decide if the defense of Latvia is worth risking a major war. 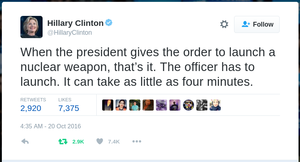 "War is the only criteria that works. All the rest is philosophy." The joint statement of former presidential candidates John McCain & Lindsey Graham is wrong - they are sadly weak on immigration. The two Senators should focus their energies on ISIS, illegal immigration and border security instead of always looking to start World War III. 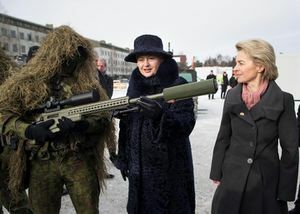 Feb. 8, 2017 German Defense Minister Ursula von der Leyen, and Lithuania's President Dalia Grybauskaite ( most expensive camouflage on photo ) speaks with a soldier. From a tabloid coverage of Russian snap check of air defenses. 7 February: NATO maneuvers and Russian snap check of air defenses. Foreign policy elites believe the US and its NATO allies can engage Russia in a shooting war without it expanding into a regional conflict and without an escalation into a nuclear conflagration. It’s a risky calculation but, nevertheless, it is the rationale behind the persistent build up of troops and weaponry on Russia’s western perimeter. It seems only a matter of time before the US finally triggers a war with any number of foreign states that it designates as "enemies" – North Korea, Syria, Iran, Russia or China. Some claim that global conflict is closer than ever before. 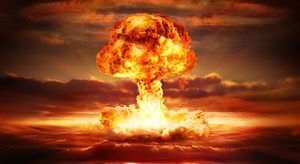 A "MESSENGER of God" who accurately predicted the major events leading up to World War 3 has sensationally revealed the exact day war will begin. General Curtis Scaparrotti requested more US troops being deployed to the frontier with Russia to fend off any moves by Vladimir Putin. Belarus official and MP Sergey Gaidukevich rejected that there is a cause of concern; it is also pointed out that maneuvers are used as a pretext to double the number of US planes in Lithuania and to deploy a company of US servicemen in each of the Baltic states during the maneuvers. DEIR EZ-ZOR - Syrian Democratic Forces (SDF) were exposed to an attack near al-Sinaa area eastern of the Euphrates River by the Syrian and Russian regimes’ warplanes. The “Committee to Investigate Russia” is the crystallization of the neo-liberal left merging with the neoconservative right, united by one common goal…war with Russia. (Response mentions re-election non-endorsement of the senior republican). Journalist John Pilger on how the world's greatest military power, the US, may well be on the road to war with China. Widely expected in February, follows from the sanctions act adopted 6 months prior in July, 2016 (see e.g Sec. 241 - the House version). Advanced Medium-Range Air-to-Air Missile: foreign military sales to Japan, Korea, Morocco, Poland, Indonesia, Romania, Spain, Turkey, Bahrain and Qatar. "At the start of the unprovoked attack on Syrian Democratic Forces and coalition advisers, coalition aircraft, including F-22A Raptors and MQ-9B Reapers, were overhead providing protective overwatch, defensive counter air and [intelligence, surveillance and reconnaissance] support as they have 24/7 throughout the fight to defeat ISIS," Air Forces Central Command spokesman Lt. Col. Damien Pickart told Military.com. "Following a call for support from Air Force Joint Terminal Attack Controllers, a variety of joint aircraft and ground-based artillery responded in defense of our SDF partners, including F-15E Strike Eagles" (see also February, 27 entry). 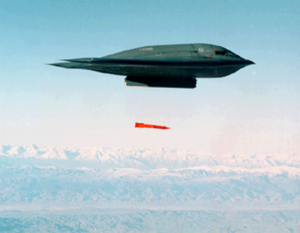 "In the new "Cold War" with Russia, Nato must be prepared for chemical weapon usage. Though Russia and the US have destroyed their chemical stocks, they still maintain the capability to produce new ones, and there is speculation that research has been done on new super chemicals many times more potent than nerve agents like Sarin and VX." Note, that the Nuclear Posture Review and the Strategic Nuclear Policy recently published by the US government state that cyber attacks such as the ones described above justify a nuclear weapon response. 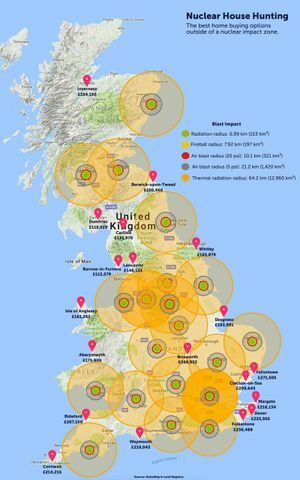 Meteor explodes with 2.1 kilotons force 43 km above missile early warning radar at Thule Air Base. 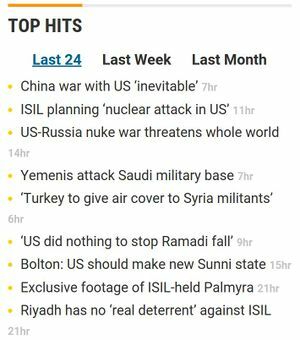 We’re still here, so they correctly concluded it was not a Russian first strike. 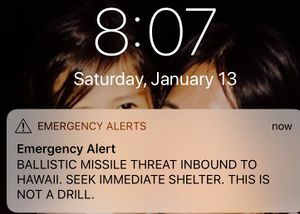 There are nearly 2,000 nukes on alert, ready to launch. US B-52 bomber tailed by Russian fighter plane over neutral waters of Baltic sea -RU MOD video, published March 23, 2019 (noted, video fragment and a mirror image). TASS: Su-27 twice in a day accompanied US bombers over the Baltic Sea, March 23, 2019. 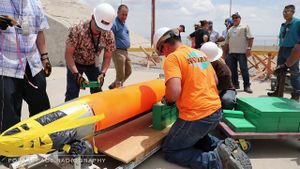 In collaboration with the U.S. Air Force Global Strike Command, NNSA conducted successful surveillance flight tests using joint test assemblies (JTA) of the B61-7 and B61-11 earlier this month. Analysis and flight recorder data from the tests indicate that both were successful.